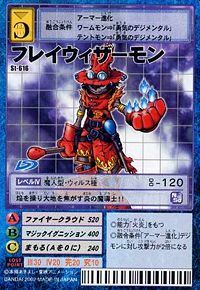 A Demon Man Digimon who armor evolved using the "Digimental of Courage". While Wizarmon is shy and does not show its true face, it is the exact opposite and confidently shows its true face. It wields two matchstick-like canes, which further enhance the effectiveness of its fire magic (a high-class programming language). 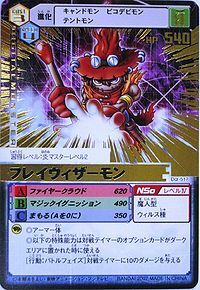 Its Signature move is Magic Ignition. 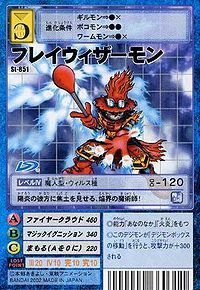 Its Special Move strikes by changing its suroundings into a storm of flames (Fire Cloud). n., Short for wizard 「ウィザード Wizādo」. Fire Cloud  ファイヤークラウド Faiyā Kuraudo Strikes by changing its suroundings into a storm of flames. 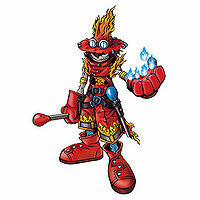 Fla Wizarmon from Revival of the Ancient Digimon!! 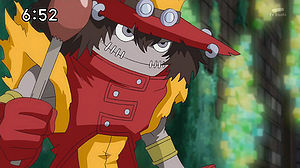 Fla Wizarmon were among the human-type digimon army under the leadership of Darcmon. 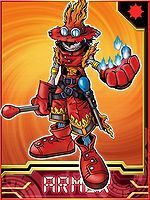 Fla Wizarmon is available as a Digimon Medal. This magician of fire controls flames and scorches the land!! This blazing magician scorches the earth beyond the heat haze! Mastery Level: Fire Master Level 2. This page was last modified on 18 March 2019, at 22:26.